It is five minutes of my life that I will never forget. When I think about that moment, I close my eyes because I can feel it happen all over again. The moment my two sons attached. Brady, the baby, was two days old. Just home from the hospital. We were all hanging out in our bed and my husband decided it would be a good time to do some “skin to skin” time with our new son. I placed our perfect little newborn upon my husband’s chest; our son’s little eyes were wide open with an intense relaxed gaze. We knew that this kind of bonding had benefits not only physiologically, but emotionally and spiritually. In fact according to KidsHealth.org, ”touch becomes an early language as babies respond to skin-to-skin contact.” Bonding often occurs naturally almost immediately for a breastfeeding mother, but it is also important for fathers to connect with their infants soon after birth, and skin to skin bonding (or kangaroo care) is an amazing and organic way to strive for this attachment. Before we could even get a picture of this amazing moment, my nearly-three-year-old, Nathan, was whipping his shirt off with urgency! “I want to do skin, to skin! Put him on me!” He was shaking with excitement, “I wanna do it, mommy! Let me have him!” My husband and I looked at each other and without a word we were putting the two children together, in our family bed, for their first attached moment. My older son has never smiled like he did at that moment. It was pure love, joy, and nature at its best. I knew Nathan was in love when he met Brady in the hospital hours after Brady’s birth. 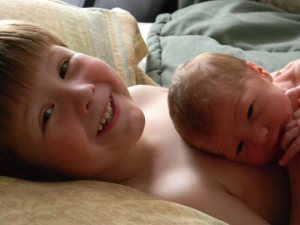 But my husband and I saw something that moment in our room, when skin to skin bonding changed their new brotherly relationship. That is when their two hearts met, beat together, and (in my mind) solidified their attachment for life. We are lucky enough to have captured these precious minutes on camera. My favorite shot has been blown up on canvas and is hanging above me so I can forever remember the love that blossomed that day. I can only hope that when Nathan and Brady become grown men and are out of the house and long gone from the family bed, that they can look at this photo fondly. If I have done my job as an attached mother, we will always be an attached family unit. Jessica M. Lang is a trained Therapeutic Massage Professional with Degrees in Holistic Health and Exercise Science. She has been helping people feeling happy, healthy and whole for over ten years. Jessica is a wife and the mother of two young boys. 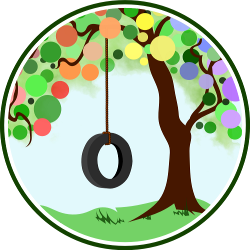 She blogs about natural and green parenting in her daily life, with a little dose of humor, at Cloth Diapering Mama. You made me cry, this is so beautiful! So so precious and beautiful!! And so my day began with a few tears — of joy. Wow Jessica, what a beautiful and touching moment…. thank you for sharing something so beautifully intimate! I could look at the photo all day! So beautiful. Oh my how you can give a girl the baby fever! I’m so glad you have felt moved by our special moment! I read this article to Nathan this morning and he was obsessed with taking another picture like that with his brother…so in between nudges and pinches the baby got lots of huggies today! Thanks to NPN for this great opportunity and to all of you who shared this and left me such SWEET comments!!! What a beautiful post. And to have a photo of your boys bonding-how precious. Something all of you will treasure forever. Oh! That is the sweetest thing. I love that picture. I’m definitely going to hope our older son and his new sibling-on-the-way have just such a beautiful experience. This made me cry. I’d like to chalk it up to being pregnant and hormonal and the fact that my own little one is on the verge of becoming a big brother, but I probably would’ve cried anyways! This is beautiful. Love it! Love the story and the picture. What a great moment to remember! Wow! All of these wonderful mommies crying over my story….that means so much…and I know its because you’ve all had, or are going to have a similar moment where the magnitude of emotion is so high it takes on a life of its own. What a beautiful story and beautiful picture! I love it, brings back memories of when my daughter met her little brother. Thanks for sharing! Oh my, beautiful! I’ll keep this in mind when we have our next, as well. Wow. Thanks so much for sharing! Linked this article on my Sunday Surf this week. Just now seeing this response. If you have questions or would like my participation in your study please let me know… however this response is over a year old, so not sure if you’ll see it!